Is there anything cosier than cuddling up with a loved one under the stars? Well, sometimes, especially when your breath’s coming out in clouds and you can’t feel your toes. 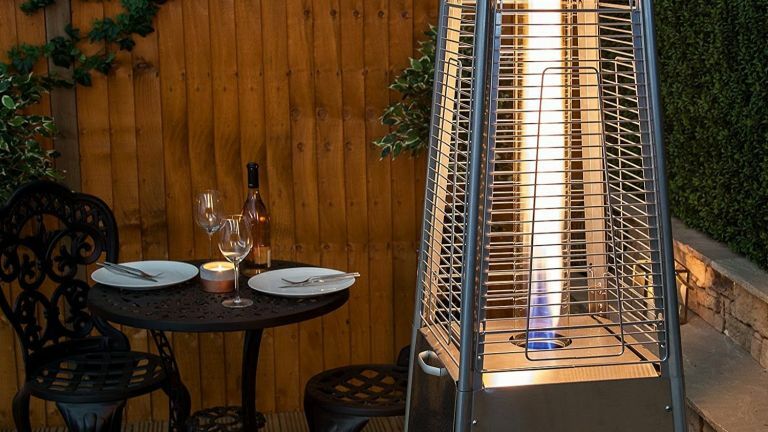 Luckily, a patio heater takes the threat of frostbite out of the equation, turning any patio, deck, gazebo or pergola into a cosy extension of the indoors. Whether you’re a bit of a party animal who frequently hosts garden parties and get-togethers, or you just want to relax with a book on a chilly afternoon, the best patio heaters make invaluable investments for extending your enjoyment of your garden. When you've chosen the best patio heater, take a look at our sourcebook of garden suppliers for all your gardening needs. If you only have a small area to heat, such as a petite patio or small balcony, then you don’t have to go for a large freestanding model. Try, instead, a tabletop patio heater, which looks a little like a bedside lamp and doesn’t give out as much heat so you won’t cook in close quarters. Owners of small gardens will also be cheered, no doubt, to hear that wall-mounted patio heaters are another viable and surprisingly adaptable option, letting you direct the heat upwards or downwards by adjusting the vent. The flipside of this, of course, is the aforementioned freestanding patio heater. It will take up more space, but if you have a large patio or deck that offers enough space for it, chances are there’s a lot more area to heat, so you’ll need the extra power they can dish out. The final consideration you need to make is the type of fuel your patio heater will use. While the easiest way to fuel a patio heater is with electricity, you may not have an external outlet at your disposal, or be nervous about the plug being exposed to the elements. The other options are natural gas and propane, the latter being the most common. This sleek, ultra-modern heater might have a touch of the HAL 9000s about it, but you certainly mustn’t let that put you off. With its ability to be used indoors or outdoors, wall-mounted or attached to the ceiling, it’s easily our most versatile heater of the bunch, while the low energy loss renders it the most efficient. The extremely low-profile design and complete lack of light output, which you’ll always get with a short-wave infrared heater, also make it the least intrusive, and the included remote handset allowing you to change the heat output at your leisure is unrivalled on our list for adjustability. Perhaps unsurprisingly, these impressive superlatives make the Shadow Noir Zero Light our best patio heater. This obelisk-style design is probably the first thing that comes to mind when you think of an outdoor heater, and there’s a good reason it’s remained so popular. The tall, elongated shape and brushed steel exterior look very impressive even when not switched on. When it is, the single bunsen burner-style flame, kept safely in check by a quartz tube, gives things a dramatic and thoroughly modern air, and adds a layer of safety without hampering the design. Reviewers found it relatively easy to put together, but cautioned that the instructions themselves left a lot to be desired. This bullet-shaped patio heater is an unusual contemporary twist on the popular tall pyramid designs, perfect if you’re after something a little more unusual. With its shorter, squatter cylindrical body, it keeps the heat at just the right level for lounging and generates a surprising amount of it, according to reviewers. Those who own it say it’s worth every penny, found it super simple to put together and have fallen in love with the modern design, but warned that the storage space won’t take a full-size gas canister, so be sure to bear that in mind before running out to your local Esso. This umbrella-style patio heater has been commended by reviewers for its strong, sturdy build, which might not sound like the most glamorous accolade in the world, but when some more avant-garde designs can be in the habit of compromising stability for design, it’s good to keep in mind. This one compromises nothing, and as well as a high-quality construction and tilt switch safety feature that let you rest easy, it looks very smart with its bronze-toned powder coated steel exterior and traditional shape. Unique among our picks is this hanging patio heater, a clever space-saving solution for small patios, decks or balconies. If you live in a rental and are reluctant to attach the brackets necessary for a wall-mounted heater, or tend to sit under a gazebo or pergola on chillier evenings, it’s a good versatile bet, able to be used indoors or outdoors. That it’s electric also means you don’t run the risk of ending the party early by running out of power, as can happen with gas patio heaters – unless there’s a power cut, of course! This inexpensive patio heater offers Scandi-style designer looks for a fraction of the price you’d expect, making it a good buy if you’re after something that looks fantastic even on warmer days. Realistically, despite being made of steel, it’s not the most durable offering out there, with paint damage being an occasional reviewers’ gripe, however it was agreed that it belts out some real heat, and looks fantastic while doing it, with its all-black design and contemporary cutouts. That it’s log-fuelled also adds a rustic edge for those who love their log burners, and the integrated storage cubby is a lovely addition. We have a separate dedicate buyer's guide to the best chimeneas. A tabletop heater is a simple way to create a cosy atmosphere at an intimate get-together or all by yourself, especially if your space is on the smaller side. Rather than having to bend around a tall centrepiece heater every time you want to speak to your guests (or see them) this compact heater invites you all to gather round and lean in, and assuming your patio already has a table, won’t take up any more floor space. Reviewers were very impressed by the amount of heat it generated without getting stuffy, which just goes to show that you shouldn’t be fooled by a small stature! This freestanding heater costs less than half of some of our other choices, but its discerning factor is that it doesn’t necessarily look like a budget option. While it might not beat the La Hacienda Oxford heater for contemporary good looks, there’s something very appealing about its space age design, with its elongated oval shape, industrial-looking grille and simple silver and black colourway. You can also choose between a design with an integrated stand, and one that’s made to fit into a parasol stand, a surprisingly useful distinction that not many heaters offer. Overall, for under £50, it’s certainly not to be sniffed at.